Having received my new Kindle Fire a few days ago, I was astonished to find that a cover/case for it costs upwards of 30$, and even a simple sleeve starts at $25. Instead of throwing my hard-earned dollars at Amazon, I created this contraption, which is both cheap and unique. The process of creating this is rather simple, and not very time consuming. Here are the steps! 1. Get a book that is the right size and thickness for a 7” reader. You can probably find one by browsing your neighborhood store or the nearest Barnes and Noble store. I felt the most suitable was Beowulf: http://amazon.com/o/asin/1593083831 It’s somewhat ironic to use buy a B&N book from Amazon, not to mention using it to store a Kindle, but perhaps it’s the best one BECAUSE it’s so ironic! The book can used or new for less than 5$. 2. Stick the pages together. This is done with simple paper glue. You should separate the front cover from the rest so it doesn’t stick – just stick some plastic bag between them, or some other plastic sheet. 3. 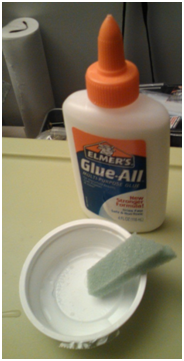 Mix half a tea-spoon of paper glue (like Elmers) with water in a 1:1 ratio. The purpose is to have the glue very thin so it soaks into the paper. 4. 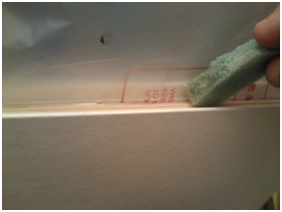 Using a brush or a sponge, coat the side of the book with glue generously. We want the glue to soak into the paper, so they all stick together to form a hard edge. 5. Put some weight on the book so the pages don’t deform, and leave to dry for half an hour or so, or until it seems dry and hard. 6. Repeat with another layer of glue, or even two layers, if you have the time. 7. 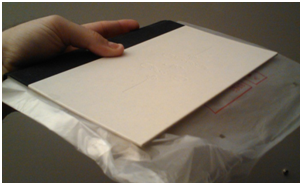 Remove the plastic, and place your ebook on the book’s first page. Mark out around it with a pen. 8. Using a metal ruler and a snap knife, cut through the pages. Be careful not to cut too deep (you don’t want to go through the back cover!). The tricky part is the corners, because when you cut from top to bottom, the angle of the knife prevents it from penetrating through more than a few layers at the bottom corner. To make it better, rotate the book occasionally and “fix” the bad corners. 9. Do this in steps, pulling out a few pages to reveal the pages below them, until you reach the bottom cover. Again, be gentle with the pressure to avoid cutting through the bottom cover. Also, be careful with the knife, as snap-knives tend to snap if you put too much pressure on them. This should still take no more than 10 minutes. 10. Check that the reader fits nicely inside the book. If it does, use the same technique as described in steps 2-5, but from the inside of the hole in the book. This is not absolutely required, but would serve to make the whole thing more stable. 11. Optional: cut out a piece of rubber or felt, and glue it inside the book. This would help the reader stay in place and not move around insid the book box. 12. Optional: get a latch, and stick it to both covers, so you can lock the book closed when not in use. Congratulations! The same technique would be useful to hide a flask of Whiskey in a book (preferably an Ernest Hemmingway book) or a pistol in a copy of "War and Peace"!